When it comes to camping, you want to travel as lightly as possible. Bringing a table along on your camping adventure can make cooking food an easier task. However, a table can take up a lot of space, which is never good when you are trying to pack lightly. 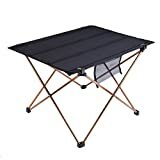 Folding camping tables are the perfect lightweight option that will make cooking out more enjoyable. Buying a camping table can be a worthwhile investment, especially if you camp out a lot. 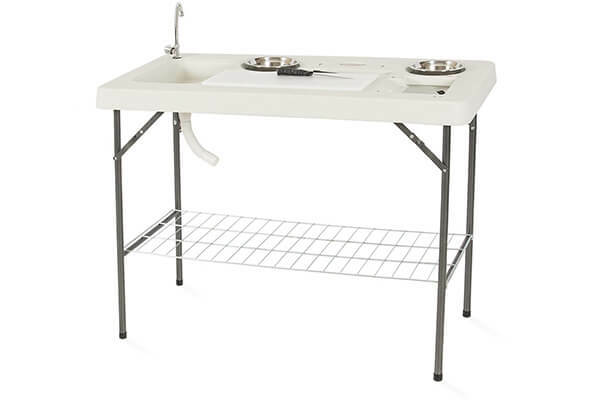 When it comes to picking out the best camping table there are many things that you should take into consideration. 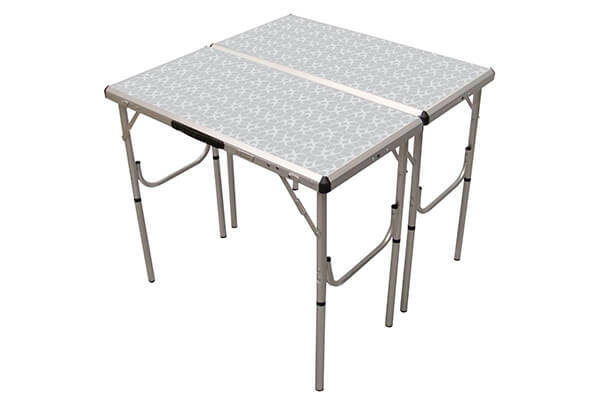 Camping tables need to durable and sturdy because you will want to use it a lot. Portability will make setting up and take down these tables an easy task. Being able to fold the table into a small size will mean that it takes up as little space as possible. 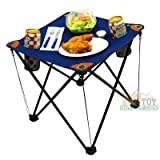 We have found the top ten best camping tables for outdoor use. The Coleman table is sturdy and versatile. Height adjustable legs means that you change the height of the table to meet your needs. The amount of table space can also be adjusted to fit your needs as well. This foldable table weighs 12.3 pounds but can support up to 300 pounds. Rio Brands Personal Beach Table is a very compact table that works to keep your drinks and other items off of the sand. 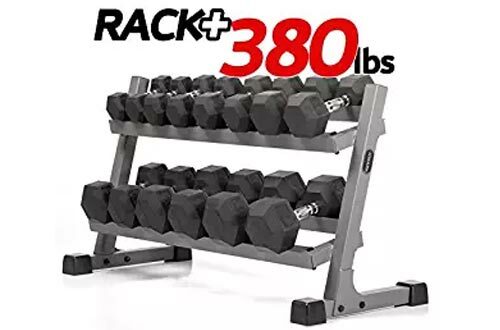 It can be folded down for easy storage and transport. 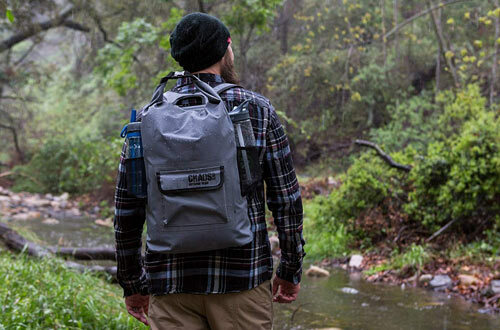 The carry bag makes it easy for you to move it from your car to the campsite. 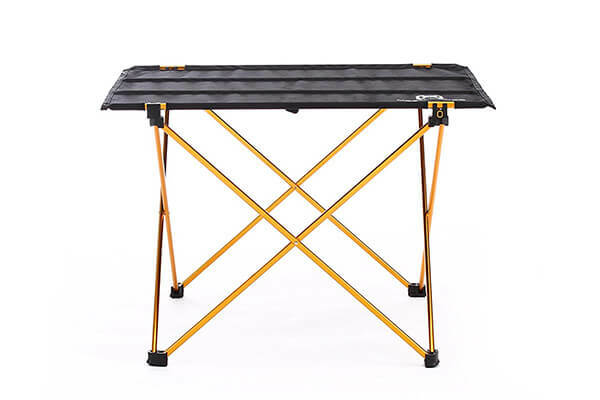 This camping table is great for tailgating, camping, hiking, and so much more. It has an insulated cooler built-in which means that you do not have to use a cooler for your drinks. The 4 cup holders mean that everyone can have their own cup holder. Tension straps work to create a stable surface that makes the food basket able to hold anything. The slim folding cook station is designed with SLIM-FOLD technology. This station has an aluminum countertop, lower racks for storage, and four plastic fold-out side tables. The aluminum countertop is made to be heat resistant. The side tables have drink holders, that can hold any sized drinks, including your wine glasses. All of this space means that you can set up your camping stove while still having space to prepare your food. 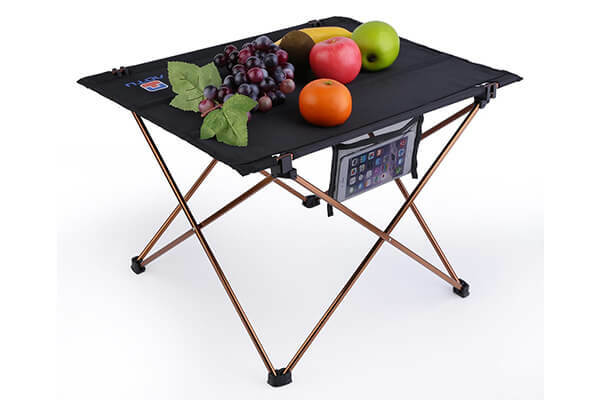 Moon Lence has created a durable and stable camping table. 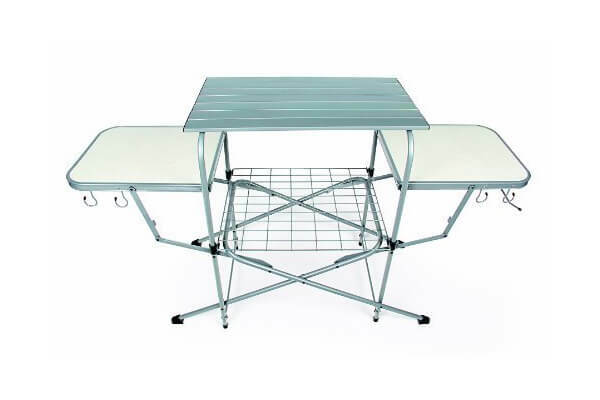 Made with Oxford cloth and high-strength aluminum alloy frame allows this table to be able to support 33 pounds. Everything on this table is able to be folded up into a durable bag that makes it easy to store and carry. 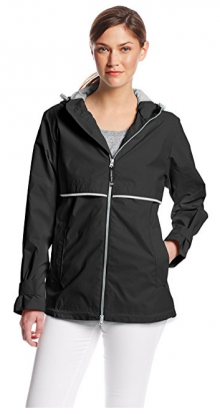 The material is waterproof and weather resistant which makes it perfect for hiking, camping, and picnics. 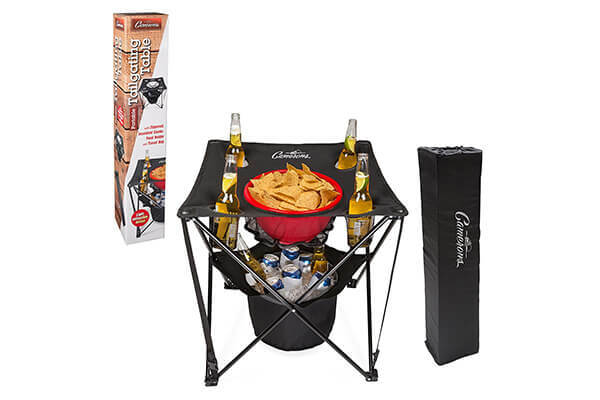 This folding camping table is great for every sporting event, camping, and even picnics. 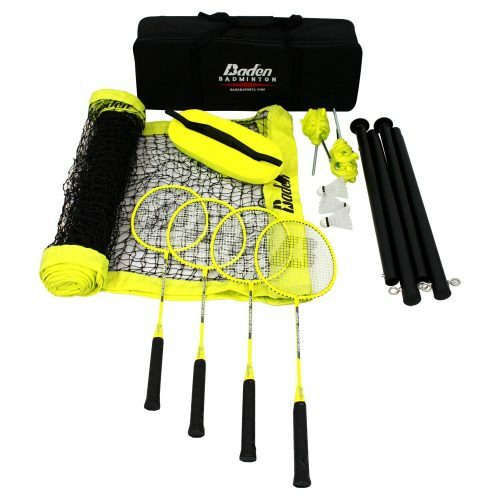 It is super lightweight, which makes it really portable and easy to carry. With 2 built-in cup holders, you never have to fit over a cup holder again. 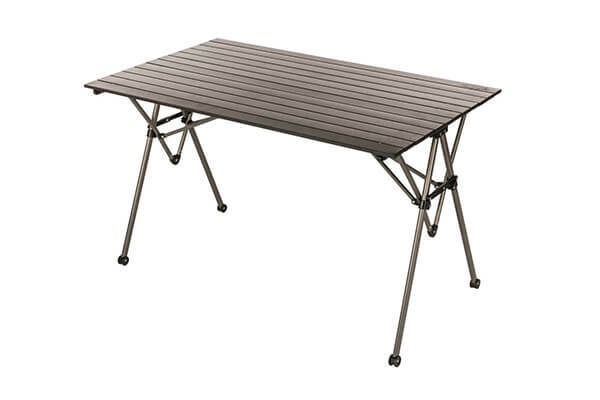 Having a strong yet lightweight construction sets this camping table above the rest. 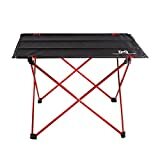 Made with aluminum alloy and ripstop nylon fabric allows this table to be perfect for camping trips, picnics, and other outdoor activities. 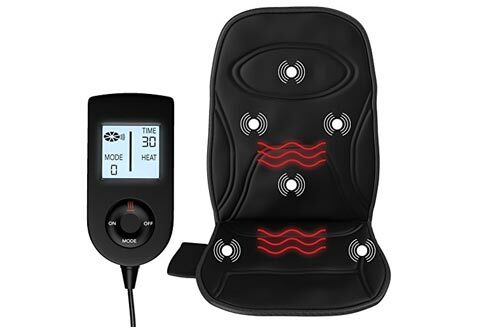 The anti-slip feet work to increase the traction on many different surfaces. 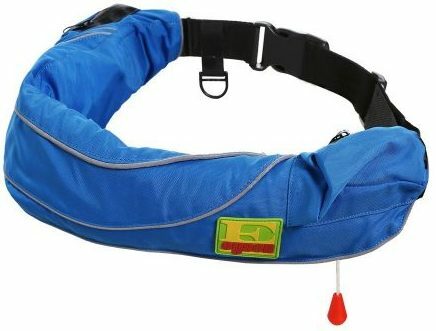 It can be easily folded up and placed in the carrying bag. Heavy-gauge aluminum frame paired with a water resistant roll-top work to create this table. This sturdy table works great for indoor and outdoor activities. 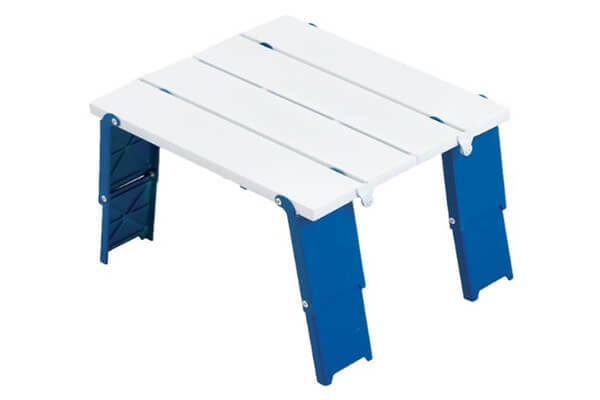 Non-skid rubber feet work to keep your table from moving around, which works to make it more stable. 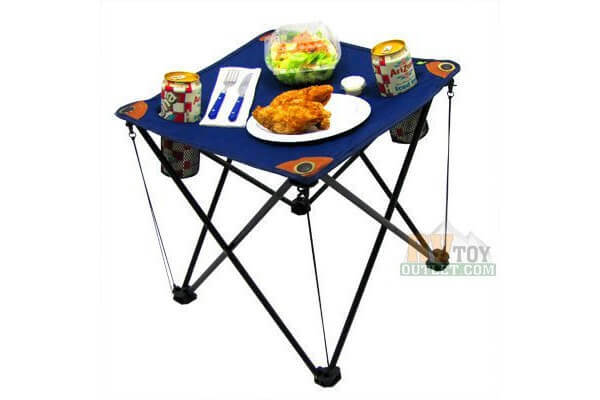 The Fishing Outdoor Table works great for picnics, camping, and other outdoor activities. It is easy to store and transport from place to place. 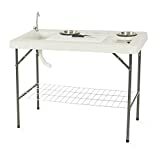 Some of the features of this table include a stainless steel faucet that can be connected to a hose, folding legs, durable plastic station top, built-in place settings for bowls, and so much more. 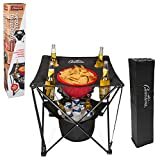 The Deluxe Folding Grilling Table is must-have camping table that is perfect for camping trips, tailgating, and outdoor parties. The grilling table is made with a steel frame and an aluminum table top but is still lightweight. 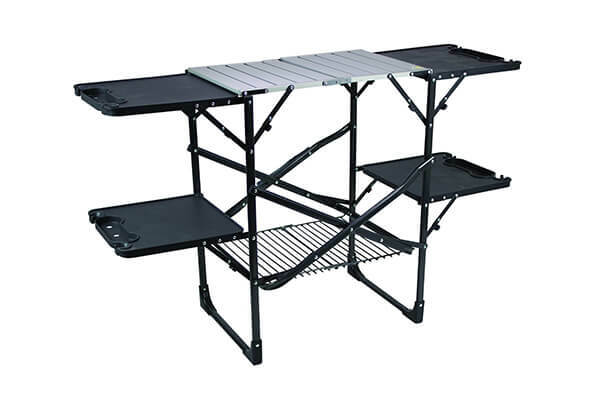 Camping tables work to make your life easier while you are out enjoying the great outdoors. Not what you are looking for? Learn more at Amazon Bestseller List.